Summer Brook Acres breeds and trains English Golden Retrievers. 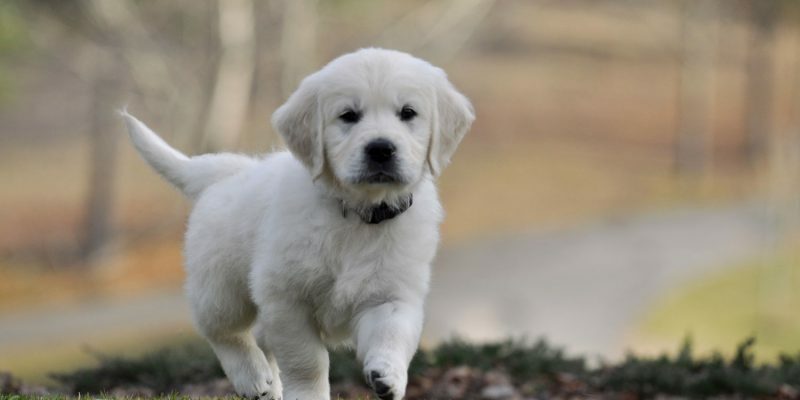 However, we have a goal that is beyond merely offering “English Cream Golden Retriever Puppies For Sale.” We are first and foremost about matching quality English Golden Retriever puppies with families who are looking for a healthy, biddable (easily trained), and beautiful four-legged companion. 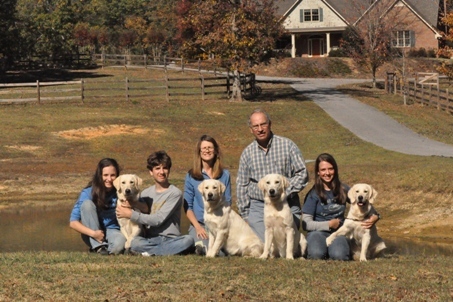 Many would call us English Cream Golden Retriever Breeders. We usually drop the word “Cream” when talking about the dogs we breed. Though we prefer the lighter colors, color is not the focus of our program. In this page, we discuss our goals, how we got started, why we breed, how we breed, who our employees are, and what kinds of dogs we have. Most importantly, this page also provides links proving the quality of our dogs and the life our puppies and dogs have here at Summer Brook. Scroll below to read more about us and the details of our breeding program. Go to the Our Dogs page for links to each of our dogs. Each dog’s page includes links to proof of all health clearances and copies of titles. You can see a dozen or more pictures of each dog as well as temperament descriptions. Before a young English Golden Retriever is added to our very selective breeding program, he or she must meet several criteria. First of all, all our breeding dogs must pass all health clearances (and not just barely). Although “fair” hips and elbows with a grade “1” are acceptable for breeding according to GRCA (The Golden Retriever Club of America), we have moved our bar a step higher. ALL of our dogs have hips in the good or excellent range and elbows that are graded as a “0” (the best possible score). We do YEARLY eye tests (and yes, we’ve retired a dog who passed an initial eye exam and later failed a yearly eye test). Our dogs have had DNA tests suggested by the GRCA and we only breed combinations with at least one “clear” on each of the DNA tests so none of our puppies can be affected by Ichthyosis, PRA 1, or PRA 2. Health is #1. Secondly, all of our breeding dogs have proof of solid temperaments. All of our breeding dogs have at a minimum of a CGC title. This is the first step toward becoming certified as a therapy dog or a competitive obedience dog. Over half of our dogs have advanced obedience titles. See Jack’s page for videos of the levels that we’ve shown Jack, Piper, and Tara. Finally, all of our breeding dogs are BEAUTIFUL. You must come to our home to totally appreciate this. However, pictures and conformation titles can give you a good idea. Many breeders have IABCA International Championships or championships from Eastern Europe. These titles can be earned at one weekend of shows with even a mediocre dog. Our dogs have titles that mean so much more in both obedience and conformation. See our Dog Titles page to learn what the most common titles are and how they are earned. 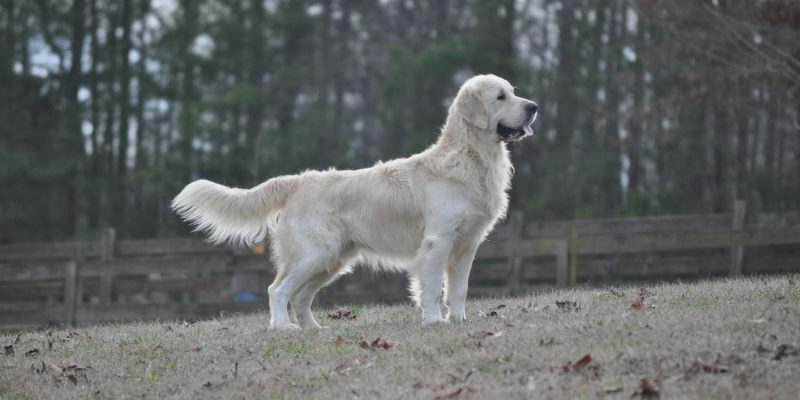 All of our Golden Retrievers are what are commonly referred to in the United States as English Golden Retrievers or English Cream Golden Retrievers. In Europe they are simply referred to as Golden Retrievers. I have heard many people refer to the imported Goldens as White Golden Retrievers. Though they are often a very light cream, they are never truly white. They range in color from the palest cream to a rich gold. As breeders of English Golden Retriever puppies, one of our goals is to improve this beautiful breed in the United States. It has taken many years to get to where we are today. To the left is our family in 2010 with some of our first dogs. Two were retired before ever breeding a litter. One of them had only one litter. We don’t hesitate to retire dogs that don’t live up to our very high standard. 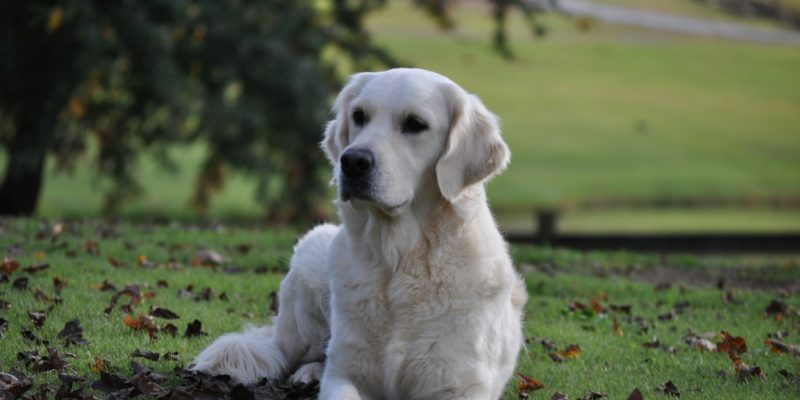 Our main goal as English Golden Retriever breeders is to produce English Golden Retriever puppies who are structurally sound, healthy, and with biddable (trainable) temperaments. Though we prefer the lighter cream color, color is only secondary. Pictured above is our family almost 10 years ago in front of our pond and home. The two older folks in the middle are Karen and Darrell. 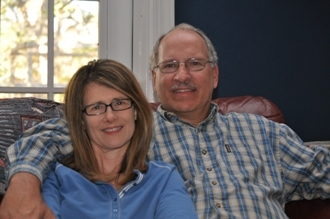 We have been married for almost 30 years. The three younger people are our three children who are now in their 20’s. All of our kids are either in college or have graduated from college. The English Golden Retrievers in the picture have now all been retired and we now have seven dogs which you can see on the Our Dogs page. While we loved our first four English Goldens, we have been able to improve our lines over time. We are very selective about the dogs we breed. In fact, we’ve retired over half the dogs that we’ve imported before ever breeding them. It has been a hard journey to get to where we are today. We strive to improve our program with each new puppy or dog that we raise. With time, we have been able to greatly improve our program. We are English Cream Golden Retriever breeders who do not settle for mediocrity. Our family lives on a private road in a community filled with gated areas, beautiful ponds and lakes, pastures, and woods. All of our neighbors have 5-50 acres of land. There are miles of trails, some going beside lakes…a dog’s paradise. Our English Golden Retrievers live and sleep in our home. We have 5 doggy doors going out of our home into five different fenced areas. Our front door gives access to a sixth. We’ve fenced about 9 of our 14 acres for our dogs. Someone is home with them nearly all the time. We are fortunate enough to have a home large enough for the dogs to have plenty of room. Our house has an open floor plan that enables us to see all of our dogs from one place. At the same time, we are still able to separate them individually or in groups when necessary. We have several baby gates that we open and close as needed. We don’t have kenneled areas to divide our dogs. However, we’ve found our home situation to be more than sufficient for the number of dogs we have. See the Our Home page for pictures and more information. Unless it is rainy, our dogs have free access in and out of our home through doggy doors. We brush each dog regularly and bathe them once or twice a month depending on the time of year. Because they have access to large outdoor areas, we rinse them off often. We do daily competitive obedience training with most of them and they all do short training sessions at meal times. The dogs rotate between the various areas in our home so that they all have quality time with us. We use primarily natural methods to prevent fleas and tics, and we feed our dogs high quality food. When we first started this venture, we were a home-schooling family with 3 children from 10-14 years of age. We’ve always been home quite a bit more than most families and had a very busy home with a lot of company and activities at our home. Our home life was (and still is) very compatible with caring for dogs. My oldest daughter Jenna wanted to be a vet for most of her young life. My younger daughter, Elise, was also wanting a career with dogs. At 12, Elise was unsure what career with dogs she wanted, but both girls had a big passion for animals. Together, they talked Darrell and I into a small breeding/show program that we thought would last only a few years. We began breeding initially purely for the love of our daughters. In the beginning, my two daughters and I were a three woman team. We had no paid employees and Darrell (husband) and Daniel (son) helped minimally. But as time went on, Darrell and Daniel become involved and we added several paid employees. Darrell now handles most of the communications. Daniel is now in his last semester in college majoring in engineering and only helps occasionally. But for many years, he was a huge help in staying up late “baby sitting” new puppies. My two daughters and I enjoyed many years of numerous mother/daughter/dogs activities. We spent many weekends going to obedience trials and conformation shows. Jenna, Elise, and I spent a good percentage of our free time researching pedigrees and breeders in Europe. We loved it! The dogs were our hobby. However, in time our daughters moved on to other interests. They graduated from high school and went to college. Both girls moved from home. It was time for a change for both the girls as well as for Summer Brook. After home schooling for 17 years, I was excited about the prospect of throwing myself into working with the dogs myself. Without the responsibilities of homeschooling, I found myself with more time to invest in my hobby. By this time, my hobby had turned into more than a full time job. In 2013, we hired our first employee, 20 year old Anna. She worked with us for about a year and then went on to become a vet tech. Then we were blessed to meet Emma, a 14 year old neighbor that has worked for us after school and on Saturdays for over four years. She is now (in 2019) about to graduate from high school and will be going to Mississippi State to pursue a career as a veterinarian. Katherine and Jessi, two other high schoolers joined our team in 2016. They both home school and are able to work mornings. All three of these girls have had a big impact on Summer Brook Acres. They will all be graduating this year. Sadly, only Jessi will stay in town and continue working with us. However, a mom’s dream is coming true. Both of my daughters are now back home working with us again! Karen is the wife/mother of the Summer Brook family and the writer of this page. In the early days of Summer Brook, my interest in breeding was purely for my daughters. However, as I got more involved with the dogs, I learned that I had a huge love and talent for dog training. That is where my passion lies, but I am involved to some degree in all aspects of Summer Brook Acres. Darrell is the husband/father of our family. His primary role with Summer Brook is with communications. I (Karen) initially handled this role. However, after several years, handling the responsibilities with both the dogs and the people became too much. Darrell also works with our family real estate investment business. Our daughter, Jenna graduated from college in English, her second passion behind dogs. After two years in a pre-vet curriculum, Jenna decided that she didn’t like biology. However, she never lost her love of animals. Her current interests in the dogs is in training instead of the medical aspect. Jenna is now combining her love of dogs (and specifically dog training) with her love of writing. She designed our website as a high school project and has done a total redesign on it twice since the original design. Jenna has written or edited much of the content on our site. She is also a very skilled trainer and helps quite a bit in that area. Our daughter, Elise has also just returned home and is now working again with us at Summer Brook. 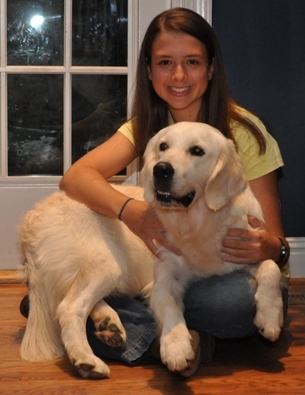 She primarily works with taking care of our adults and working with younger puppies. Her plan is to start nursing school in the fall of 2019. She will continue working part time with us and live at home until she finishes school. Before getting our first dogs, we spent hundreds (maybe thousands) of hours researching. We started off deciding on the breed. From there, we moved to researching breeders and individual dogs and pedigrees. It took us YEARS to refine our program to what it is today. We retired more than half of what we originally imported without ever breeding them. For those of you considering a new breeder or breeders with adults without verified clearances, proceed with care. There are a lot of European breeders that are exporting entire litters of what Americans are calling English Cream Golden Retrievers. In Europe, many of the parents of these puppies are considered by Europeans less than mediocre and just plain old Golden Retrievers. Many Americans are buying dogs with FCI clearances that are not official. These clearances can be obtained from vets on dogs less than a year old. This type clearance is useless. See our page on How to Find a Good Breeder for more information. Our experience is not unusual for good breeders. There are a lot of hoops to jump through in order to have really good breeding dogs. It is not as simple as calling or emailing a European breeder and asking for the best dog. The best breeders in Europe are very particular about where their dogs go. It takes time to develop relationships overseas. And it takes patience to build good lines with good looks, health, and temperaments. In addition to our English Golden Retrievers, over the past almost 20 years, our family has had one American Golden and 4 smaller dogs. These 5 dogs were family pets and never bred. Over those same 20 years, we’ve had many other animals as well. Our family has had six horses, three birds, a rabbit, and three cats. Not all of them were at the same time! We loved them all. However, none of them quite captured all of our hearts like the Golden Retrievers. Many people contact us looking for a “white golden retriever puppy with a blocky head”. Though all our dogs are a light cream, we do not breed for color. We feel that the head is important but, it is not the entire package. There is so much more in producing a nice litter of puppies. We will only breed the best dogs that meet our very high standards. We have intensely studied the pedigrees of hundreds of dogs looking for those with generations of proven good conformation, good health, and a typical sweet Golden Retriever temperament. Most of our dogs have parents with not only titles earned because of their beauty, but titles proving their worth as working dogs also. While our dogs are beautiful, we believe that a good pet, first and foremost, needs to have a good temperament and be healthy. Our goal is to produce puppies that are physically, intellectually, and temperamentally as close to the FCI breed standard as possible, and then to do all we can to nurture and care for our puppies in such a way that they will have the best possible start in life to develop to their fullest potential. See our page on Why Choose Summer Brook for more information. We are in Chelsea, AL, about 20 miles from Birmingham. People have flown or driven to us for puppies from almost every state in the country. We’ve had two or three dozen fly to us for puppies from California alone. Several have come to us from other west coast states including Oregon and Washington. Dozens have come to Summer Brook from Texas as well. Some Flying. Others driving. In the Northeast, you’ll also find about a dozen Summer Brook puppies in New York. There are quite a few in Pennsylvania, New Jersey, and Maryland. We have several puppies in Illinois and Wisconsin, a few in Ohio and Indiana, and some in Missouri and Minnesota. Many families have driven long distances for Summer Brook puppies. One family drove 1000 miles from Nebraska, a second from Massachusetts, and a third drove from northern Maine which is about 1400 miles. Over a dozen have driven from Texas and states such as Oklahoma and Arkansas. And let’s not forget our southern neighbors. You’ll find dozens of our puppies in Florida, not to mention Georgia. We’ve certainly had our share of puppies go to Tennessee, and a few to Mississippi. There are at least a dozen Summer Brook puppies in North Carolina as well as South Carolina. We have puppies all over the south. We don’t just offer “English Cream Golden Retriever Puppies for Sale!” Summer Brook could sell puppies all day, but that is not our goal. We get tremendous satisfaction from matching puppies to families. We will only send our puppies home with families who have time to raise a puppy. Our puppies go to families who want more than just a dog. They want a companion. We are looking for just the right families for our puppies. At the same time, we are busy raising puppies to be suitable companions for families. It is the ultimate reward when we see happy families meet happy puppies! To the right is Elise with Maria who unfortunately did not have good enough hips for breeding. She was the first of many dogs that we’ve loved and then said good-bye to. 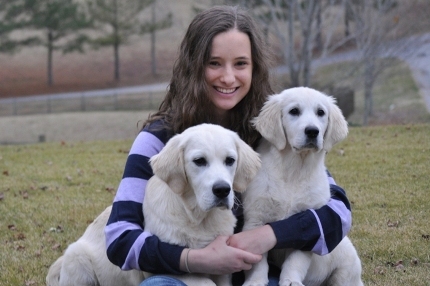 To the left is Jenna pictured with our first two Dream Max dogs when they were puppies.